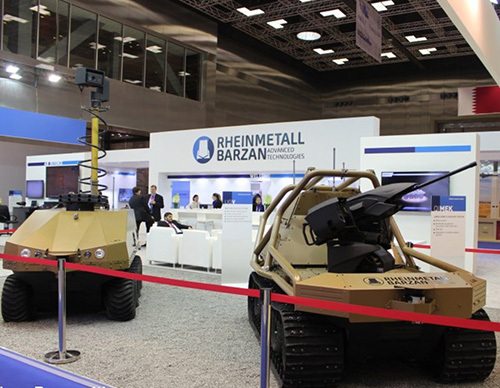 At the recent Doha International Maritime Defense Exhibition (DIMDEX 2018), an agreement between Barzan Holdings, which is owned by Qatar’s Ministry of Defense, and German defense company Rheinmetall AG has created a JV called Rheinmetall Barzan Advanced Technologies (RBAT). RBAT will develop an ammunition manufacturing base in Qatar, provide security for strategic venues and critical infrastructure in Qatar, and develop research in Unmanned Ground Vehicles (UGV) and high energy lasers. Production of wide range of modern explosive ordnance. The company strives to build sustainable capabilities in Qatar to enhance self-sufficiency, deliver force-multiplying effects to customers, and generate exciting career prospects for Qatari citizens. On the third day of DIMDEX, RBAT signed four agreements. RBAT signed a notice to proceed to build an ammunition production plant in Qatar to produce various types of ammunition, ranging from medium caliber rounds to aircraft bombs and missile assembly. It is expected that over 200 skilled jobs will be directly generated in connection with the plant. A MoU was signed between RBAT, Barzan Holdings and other Ministry of Defense stakeholders to produce explosive ordnance in Qatar, and the formal training of specialists in explosive ordnance. In the presence of the Commander of Qatar’s National Service, RBAT signed an agreement to establish a highly realistic laser training solution that will simulate live training scenarios within a mock urban environment to help ensure that Qatari National Service Cadets are prepared in the best possible way to serve the State of Qatar. RBAT signed an agreement with the Qatari Emiri Naval Forces to provide critical infrastructure protection to safeguard military and economic sites in Qatar, including fully integrated security and surveillance systems for a new naval base.